My husband and I live in a 2-bedroom single-family home in San Francisco, a cottage built in 1922 (no in-law unit, no garage, just a cottage & a large yard). My husband moved into the place 8 years ago, and I moved in with him over 5 years ago. My husband has been the master tenant since I moved in. Our landlord lives in Santa Barbara and has always rented the house to family or friends of family (we’re in the latter group). We have one of those absurdly good deals: our rent is nearly a third of market rate ($1300/month) and it hasn’t been raised in 5 years. In exchange we are responsible for all utilities, and if any maintenance is needed we just have to notify our landlord, pay the bill ourselves, and deduct it from the next month’s rent. Of course, all good things must come to an end. Our landlord is planning on selling the house in order to get some money for a down payment to buy a home in Santa Barbara (he is newly married and ready to start a family). The realtor he’s using has been very honest and forthcoming with us and told us the estimate is a bit bleak: a LOT of significant work needs to be done on the house. He’s offered to sell the house to us directly for $600k. If we don’t buy it, he wants us to vacate the house before he puts it on the market. We are most likely not going to buy, because there’s no way we want a $600k house that needs over $100k in repairs. Obviously this means we need to move out, but I don’t know what our rights are as tenants since there are so many exceptions to rent laws for houses. I’m pretty sure this falls under the Ellis Act, which means we get four months notice to vacate and relocation money. I don’t know if our landlord is aware of the relocation money, since he’s been extremely hands-off for nearly 10 years and doesn’t even live anywhere near San Francisco. Even though we’ve had a good, non-contentious relationship with him, I want to be armed with all the relevant facts. Besides, that relocation money is a huge boon to getting a place that let’s us keep our dog! Any help you can give me is greatly appreciated. You asked about your rights so I’m going to lay them out for you. I’ll let the readers discuss your moral obligations. Because the house was built in 1922, it is subject to the just cause provisions of the San Francisco Rent Ordinance section 37.9. The landlord cannot ask you to move or serve notice to evict you simply because he wants to sell the house. Of course, selling the house devoid of tenants is ideal for for staging and marketing it for maximum profit. I see various estimates of the value of selling an empty unit/house ranging from 5-25% of the market value of the property. If the landlord wants you to leave before he sells, he will have to negotiate a deal with you to vacate. The landlord can evict you using the Ellis Act (a 1985 gift from California legislators greased with payola from the real estate industry). The landlord can “exit the landlord business,” evict you, and sell the house. A future owner’s ability to rent would be prohibited/severely limited for ten years, but that isn’t often a concern for the buyer of an overpriced San Francisco house who simply wants to live there. You and your wife would have 120 days to move and receive relocation payments of $5,210.91 apiece or an additional $3,473.93 per disabled tenant. 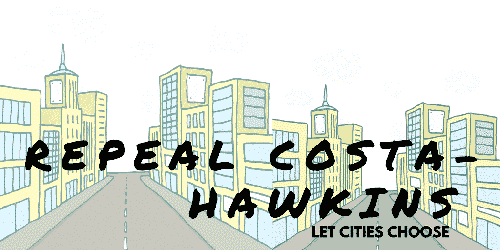 Costs Hawkins tells us that the landlord can increase the rent to any amount he wants. Even if the landlord uses the current market value as a barometer, using your estimate, he can increase the rent to $3,900.00 per month. If you move based upon a rent increase you cannot afford, you could argue that the landlord’s dominant motive for increasing the rent was to make it high enough to force you to move rather than continue to rent it–that really intended to sell the house. There are a few cases in the courts litigating that issue right now. If you don’t move and the landlord sells the building with you in it, the new owner can increase the rent. If a new owner wants to move in, he can evict you under Rent Ordinance § 37.9(a)(8). In that case you and your wife will be entitled to $5,207 apiece and another $3,472.00 if you are disabled, with 60 days to vacate. My land lord gave me an illegal eviction. He claims this building is condem by the city. But I haven’t gotten no prove from the city. Can I sue him.